Dr. Britton offers a variety of services including: One to One ADHD Coaching for children, teens, young adults and adults, Parent Coaching, ADHD Parent Support with Teacher Conferences and IEP/504 Meetings. 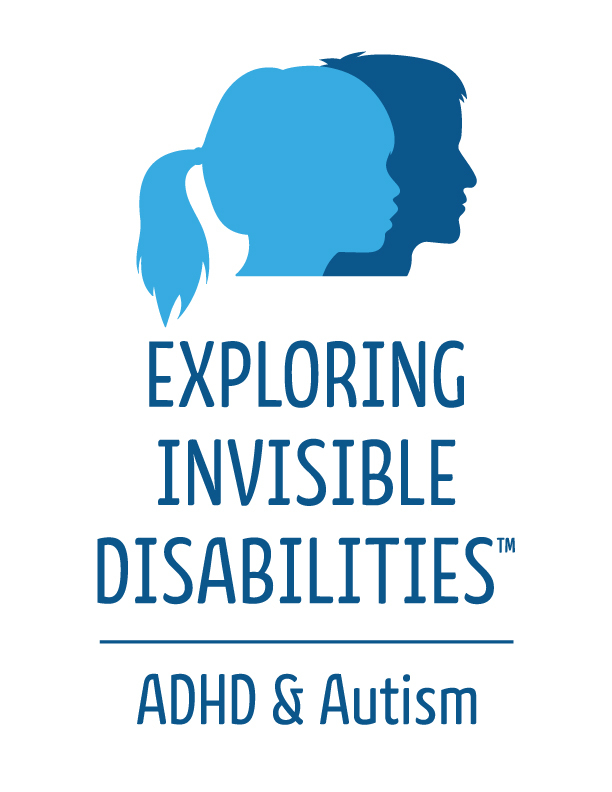 One to one, face to face coaching for Children, Teens and Young adults with ADHD or the development of their Executive Function Skills. "My life before professional coaching was quickly crumbling. From an unrewarding career path to marriage conflicts and parenting setbacks, my day-to-day schedule had put my brain on a permanent spin cycle. I was doing everything and getting nowhere. It’s amazing that you can spend as little as 30 minutes a week by phone working with Coach Cindi Britton and make tremendous progress with never meeting her face-to-face. Cindi sets you on a simple path to understanding what matters to you. As you begin to get clear on your goals, then you progress to realizing them. She shows you how to get to the heart of what matters and through that process, you learn how to listen to and trust yourself and your instincts. Before Coach Cindi, I was trying too hard to make life work and thought it was selfish to focus time on myself. The reality was very different. Putting my needs first actually made it easier to get clear and be more present for others. I highly recommend the style and format of professional coaching offered by Cindi Britton. She manages her time and your time in a respectful and collaborative way. It’s like experiencing a sort of magic that just happens through simple techniques for managing everything from ADHD to a mind in overdrive. "I was at a crossroads with my business wearing many hats and juggling it all on my own. I knew where I wanted go and needed some help to map out the plan. Cindi is a wonderful listener and helped me get clear on what steps I needed to take to move forward." “Dr. Cindi helped me organize my thoughts into goals and steps to get there including creating a budget. I was also having difficulty with some of the people I had in my life. I was afraid and stressed about conversations I needed to have with my boss, my parents, and my ex-boyfriend. Coach Cindi guided me through planning what I would say which really helped me and the conversations went well. I’m now able to apply some discipline to my life with things being cleaner and having an organizational system that works for me. Cindi gave me tasks that kept be from feeling embarrassed and overwhelmed. 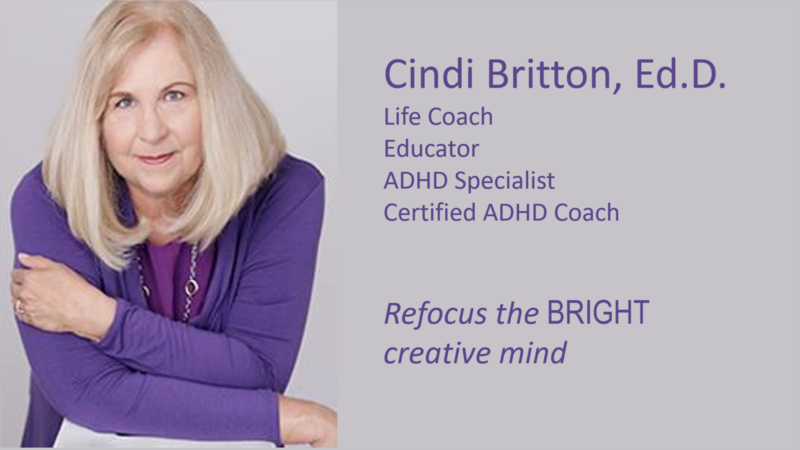 Dr. Cindi Britton specializes in both Life Coaching and ADHD coaching helping people through major life transitions such as facing divorce, changing careers or embarking upon retirement. Her ADHD coaching is an ongoing partnership that helps students and adults learn the Executive Functioning skills necessary to increase their school and life success. She has developed a unique coaching method to deliver positive results. She has a BA., MA Ed., Ed.D, is a Certified Guiding Mindful Change Coach, and is JST Trained in Coaching Children with ADHD, Executive Function, and Behavioral Challenges.